Are We in Another Dotcom-Type Bubble? The markets are at record levels and investors are afraid to miss out on strong gains that have come over the last eight years; especially since Donald Trump won the November 2016 election. But has the euphoria sent stocks to unsustainable levels that echo the dotcom bubble of 2000? When it comes to stock market bubbles, the dotcom crash is one for the ages. Unlike other financial bubbles, the dotcom bubble seemed like a sure thing. Stocks were taking advantage of a new medium that was changing everything: the Internet. While that was indeed fact, many dotcom stocks with sky-high valuations had terrible fundamentals and were based on pure fiction. Taking a look at the similarities and a list of companies that both survived the 2000 dotcom bubble and failed could help prepare investors for the upcoming stock market crash. Investors will say the current bull market and record stock market levels have nothing in common with the dotcom bubble. But today’s bull market has eerie similarities to the dotcom bubble of 2000. On March 9, 2017, Wall Street celebrated the bull market’s eighth anniversary. And the bull market celebrated in style. In early March, the Dow Jones Industrial Average surpassed the 21,000 mark, marking a 227% gain since the markets bottomed in March 2009. Meanwhile, the S&P 500 is at record levels and has advanced around 260% over the same time frame. Another anniversary took place on March 10, 2017, but there were no celebrations. It has been 17 years since the dotcom bubble reached its zenith, when the tech-heavy Nasdaq hit a then-record all-time intraday high of 5,132. It would take more than 15 years for the Nasdaq to reclaim those losses. It too celebrated its dubious anniversary in style; in late March, the Nasdaq hit a new record intra-day high of 5926.06. This represents a 368% gain over its March 2000 low of 1265. The dotcom bubble of the late 1990s and 2000 was a speculative bubble that formed when investor interest in Internet companies soared. It seemed so easy. Build a website and the buyers will come and spend their money. It was a win-win situation. Only it wasn’t. Over the five years leading up to the stock market peak in March 2000, investors poured money into Internet companies with no proven business strategy; meanwhile overzealous management burned through the money in an effort to grow the business and take it public. When these companies went public, more and more investors piled into the markets because they were afraid of missing out on a sure thing. The best way to make sure you were in on the ground floor was to buy, buy, buy on the IPO and ride the wave to retirement riches! Still, the fear of missing out sent the Nasdaq to an all-time high of 5132.52 on March 10, 2000. But then, with no warning, stocks started to sell off. By October 9, 2002, the NASDAQ had lost 78% of its value. What happened? No one knows why the sell-off started on March 11, 2000. What we do know though is that investors suddenly realized that a tech and/or Internet company with a billion-dollar valuation that has no revenue or earnings is saddled with debt and has no future. It is worthless. It started as a trickle but resulted in a tsunami. Investors wanted out and tech stock that once had valuations in the billions dried up. Tech companies, desperate for new capital, went broke. And the once high-flying CEOs moved out of their opulent mansions and back in with their parents. It took 15 long years for the Nasdaq to soar back to those lofty heights. But this time it’s different. Or so we’re told. But is it? Are the record levels on the NASDAQ, S&P 500, Dow Jones Industrial Average, and NYSE built on a foundation of financial fact or is it another illusion ready to burst? During the dotcom era, investors were more enamored with technicals and momentum than they were with traditional things like fundamentals. It sent valuations into the stratosphere and stocks became wildly overpriced. When investors finally did pay attention to valuations, they sold off hard and fast. Today’s stock market is in pretty much the same boat. How high were stock market valuations during the dotcom disaster? They’ve never been higher. The cyclically adjusted price-earnings (CAPE) ratio, which helped Robert Shiller win the Nobel Prize for Economics in 2013, compares current prices to average earnings over the last 10 years. In 1999, the ratio stood at 45. This implies the S&P 500 was overvalued by 181.5%. What that number also means is that for every $1.00 in earnings, an investor was willing to pay $45.00. 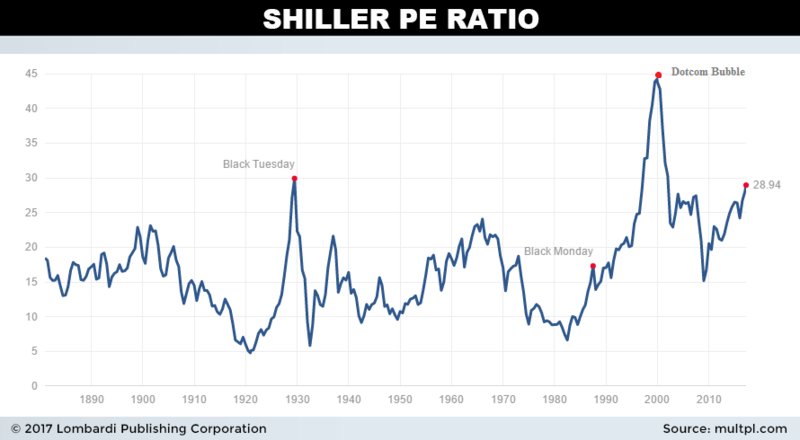 To put that into context, in 1929, just before Black Tuesday, the ratio was 30, suggesting the S&P was overvalued by 87.5%. What’s the third-highest valuation of the S&P 500? March 2017. Over the four months after Donald Trump won the election, the S&P 500 soared 14%; the S&P 500 did in four months what many analysts were predicting for the entire year. Euphoria and optimism about Donald Trump’s economic policies, not strong earnings, have sent stocks soaring. Near the end of March 2017, the CAPE ratio is at 28.94; this suggests the S&P 500 is overvalued by approximately 81%. The dotcom bubble burst in 2000, taking the Nasdaq and a number of well-known, and by now, mainly forgotten, companies to their knees. Below are some of the biggest dotcom failures. The concept was great, but not even a cute mascot and some of the best commercials from the late 1990s could save Pets.com. Pets.com was a pet food and supply company that was a little ahead of its time. You could buy kitty litter online but it took days to get it. Moreover, Pets.com undercharged for shipping to attract customers; this makes it difficult to make money. Amazon.com, Inc. (NASDAQ:AMZN) helped Pet.com raise $82.5 million in an IPO in February 2000. When it went public, the stock started at $11.00 and climbed to $14.00. But that was it. In the first nine months of 2000, it lost $147.0 million and was never able recover. By November, the share price had spiraled below $1.00 and the company shut its doors. Another idea that works today but couldn’t gain traction in 2000, Webvan.com was a grocery delivery store service that grew too quickly, expanding to eight cities in just 18 months. In the summer of 1999, Webvan.com announced it was investing $1.0 billion in warehouses and would expand to 26 more cities by 2001. At its IPO in November 1999, Webvan.com raised $375.0 million and its shares traded at around $30.00. At its peak, Webvan.com had a market cap of $1.2 billion. Unfortunately, the company’s business model failed to catch on. Instead of expanding to 26 cities in 2001, it streamlined to zero. Webvan.com’s share price fell to $0.06 per share and it closed in July 2001. You can’t say the early adopters of the dotcom model didn’t have good ideas. eToys.com was an online toy retailer that hit the ground running in 1997. It also had a big audience and quickly became one of the most popular sites for holiday shopping. In May 1999, eToys.com raised $166.0 million when it did its IPO; by October 1999, its share price had hit $84.00. The joy was short lived. Like many dotcom stocks, the company spent millions on advertising but failed to generate much money. In the fourth quarter of 2000, eToys.com reported a loss of $74.5 million and said it only had enough capital to crawl to March 31, 2001. This did wonders for the company’s share price. By February 2001, you could snap up eToys.com for $0.09 per share. And by March, it was worthless. Flooz.com is a good example of a bad idea that no-one wanted to miss out on. Flooz.com was an online currency, promoted by Whoopi Goldberg, which was designed as an alternative to credit cards. Unlike a gift card or credit card that is backed by a specific retailer, Flooz was just Flooz. You would purchase Flooz and use it at any (small) number of retailers including Cisco, Delta Air Lines, Tower Records, and Barnes & Noble. Despite raising $35.0 million from investors, Flooz.com went bankrupt in the summer of 2001, less than two years after it opened its virtual wallet. theGlobe.com is famous for two things: being one of the first social media sites and its record setting first-day IPO gains. First, theGlobe.com was revolutionary in that it allowed visitors to create and post their own web pages; thereby making the Internet accessible to anyone. The company went public on November 13, 1998 with a set offer price of $9.00 per share. But investors know a good thing when they see it…and certainly don’t want to miss out on anything. The stock opened at $87.00 and hit an intra-day high of $97.00; for a one-day gain of 977%, before closing at $63.50. theGlobe.com raised $27.9 million in its IPO and had a market cap of $842.0 million. It walked a familiar path; in August 2001 it was delisted from the Nasdaq for failing to meet the $1.00 minimum share price. While virtually every dotcom stock took a major hit when the bubble burst, not all disappeared. Some regrouped and are now the darlings of the Internet. And Wall Street. Below are some of the biggest and best dotcom companies from the dotcom bubble days. When Amazon.com, Inc. (NASDAQ:AMZN) was founded in 1994, it was an online bookstore. Since then, it’s diversified its offering a little and is now the world’s largest online retailer. Amazon.com’s IPO took place on May 15, 1997 at $18.00 per share. During the heady days of the dotcom bubble, Amazon.com’s share price soared to $107.00 per share. Like other dotcom companies, Amazon, at the time, wasn’t all that focused on making money. As a result, its share price took a well-deserved dive when the dotcom bubble popped, plunging to just under $7.00 per share. But Amazon.com dusted itself off and focused its attention on fundamentals. In 2003, Amazon.com reported its first annual profit of $35.3 million versus a loss of $149.1 million in 2002. By early 2017, Amazon.com’s share price was trading for more than $850.00 and had a market cap of more than $402.0 billion. eBay Inc (NASDAQ:EBAY) is the world’s most popular online auction and retail site and was born in 1995, around the same time as Amazon.com. The company experienced strong growth in the early days, from 250,000 visitors in 1996 to two million in January 1997. If any dotcom was looking to go public it was eBay.com. The company went public on September 21, 1998 at $18.00 per share and tripled that first day, hitting $53.00 per share. eBay’s share price was hit by the dotcom bust, but because of its unique platform, was able to rebound, expand, and grow in popularity. eBay trades for more than $33.00 per share and has a market cap of $36.08 billion. Priceline Group Inc (NASDAQ:PCLN) is another high-flying Internet stock that survived the dotcom crash. Discount travel web site, Priceline.com was founded in 1998, and allowed users to name their own prices on airfares, car rentals, vacation packages etc. On the first day the company went public in March 1999, Priceline.com’s share price soared from $16.00 to over $86.00. Over the following years, which included the bursting dotcom bubble, the company’s share price tumbled to under $10.00 per share. In addition to the dotcom failure in 2000, Priceline.com’s share price faced additional pressure after the September 11, 2001 terrorist attacks decimated the entire travel industry. In the aftermath, Priceline.com rebranded itself around hotels, not airfares, and expanded its presence internationally. The strategy worked. Priceline.com’s share price trades for more than $1750 per share. During every economic cycle, stocks rise and fall. The key is finding stocks that are fairly valued and have the products, services, and management that can help it rebound as the rest of the industry is crashing and burning.